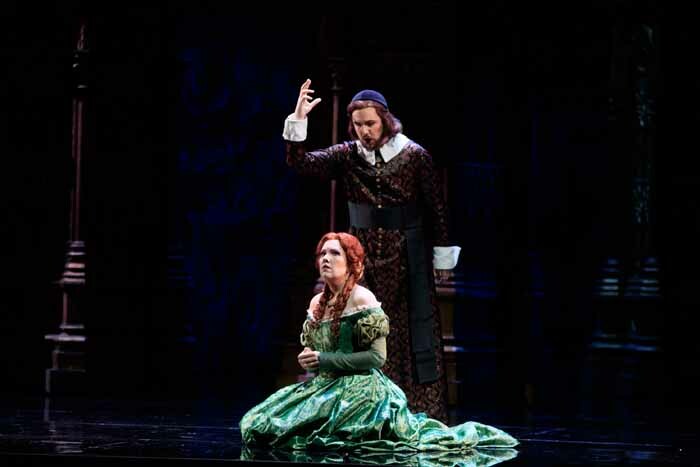 This was a revival of a 1998 production originally done in collaboration with the Metropolitan Opera, New York. Miles Gaythwaite saw the performance on May 21 and has provided the following. What a wonderful way to spend a Sunday afternoon seeing an opera with a first rate cast, a conductor and orchestra who were quite at home with Donizetti, and an excellent chorus and all done in a very stylish period production which followed the libretto conscientiously. This happy situation depended heavily on two features of the way in which the Capitole works, the very strong in-house direction and design of productions and the use of singers who are at the beginning of their careers. 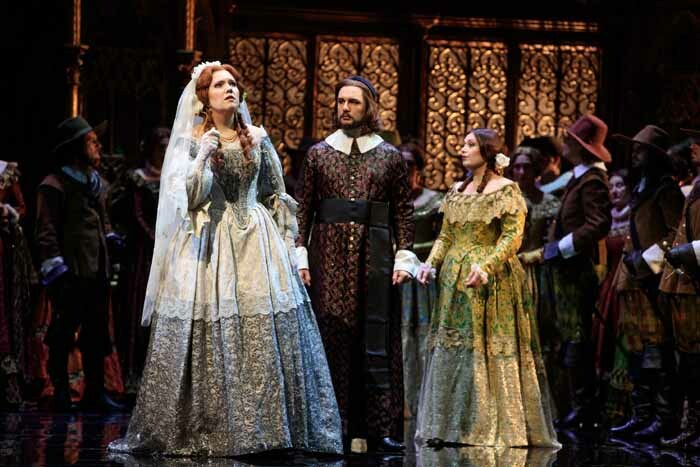 I had not been planning to come to Lucia but when I decided to do so I was delighted to see that the production by Nicolas Joel was one that I had already seen here in 2004 although it had originally been staged in 1998. 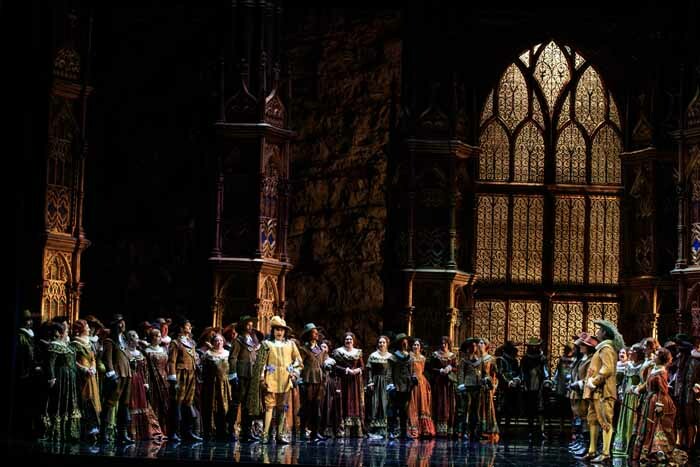 Nicolas Joel was not just the Intendant but also one of the main directors for operas and had gathered round himself a group of very gifted colleagues: Ezio Frigerio for the décors, Franca Squarciapino for the costumes, and Vinicio Cheli for the lighting. This was certainly one of their many successes. Nicolas Joel was of the view that opera productions had to be comprehensible to the audience and his style was very much to follow the libretto, even when sometimes the libretto was a bit muddled. 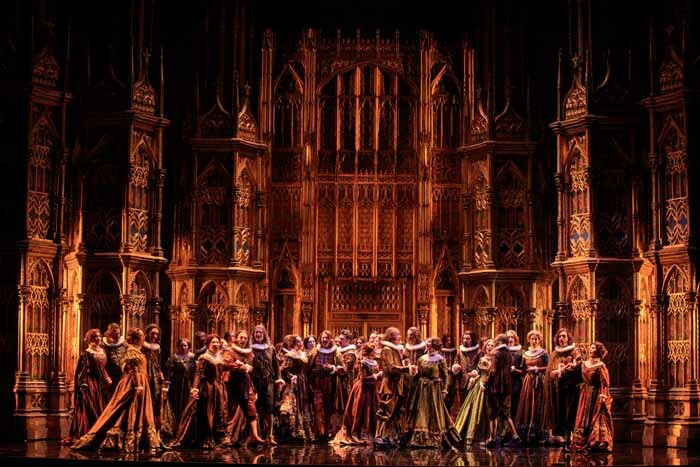 Very fortunately this approach recommended itself to the Metropolitan Opera in New York and certainly this production (and many of their other productions) were done at the Met. Then comes the question of costumes. At that time the costumes for the productions were sumptuous and Franca Squarciapino was particularly good at designing the costumes. The costume workshops at the Capitole were very good indeed and they must have used acres of silk, velvet and lace to produce authentic costumes. Very fortunately the Met were also interested in having gorgeous costumes. Also when you take into account the fact that costumes were needed not just for the principals but for the chorus who numbered something between 50 and 60, that amounts to a lot of costumes. 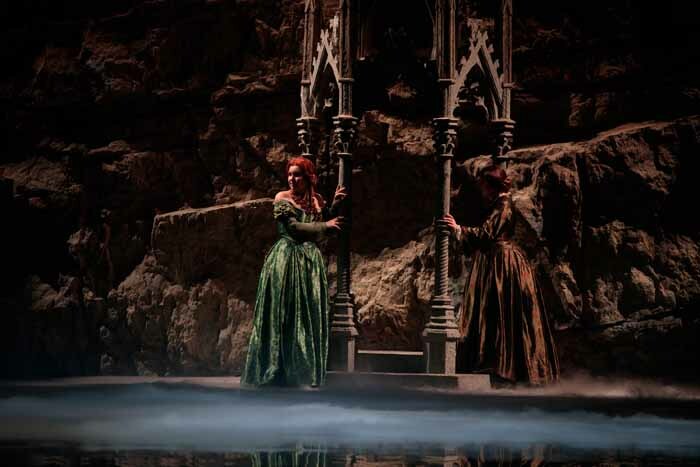 This production is set in a romanticised medieval Scotland and the sets were extremely grand. Another great feature of the Capitole has been their enthusiasm for acting as a launching pad for talented young singers. In this they were lucky that Nicolas Joel was very gifted at selecting the singers he wanted to encourage. 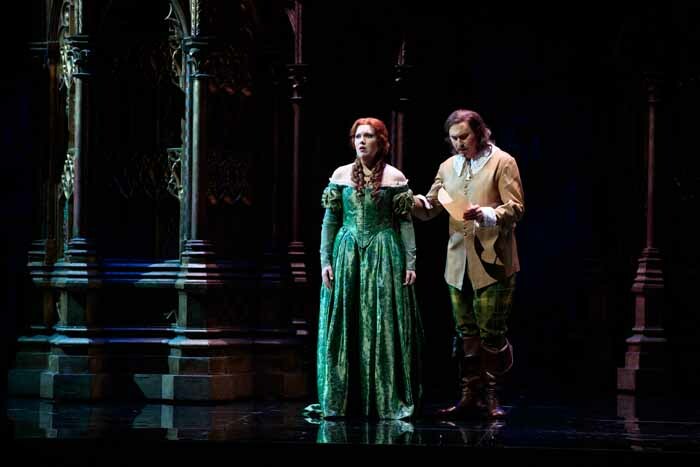 A lot of the singers who now sing internationally started their careers in Toulouse and they form a group of staunch supporters of the Capitole who come back frequently to the Capitole sometimes just for minor roles or even cameo parts. When it comes to the singers who were chosen for this production I think we were seeing this policy in action, although most of these principals were not just being launched on their careers, and most are definitely ready for take off. So to turn now to the actual singers, the most important one in this opera is Lucia herself. The Lucia, Nadine Koutcher, was very fine indeed. She has a lovely even and generous voice but she did not shout and could manage the high notes with perfect aplomb. Even the mad scene she handled extremely well and for that she got a prolonged ovation. Additionally she was a pretty good actor and put all that together and you have an excellent Lucia, who really dominated the rest of the cast. 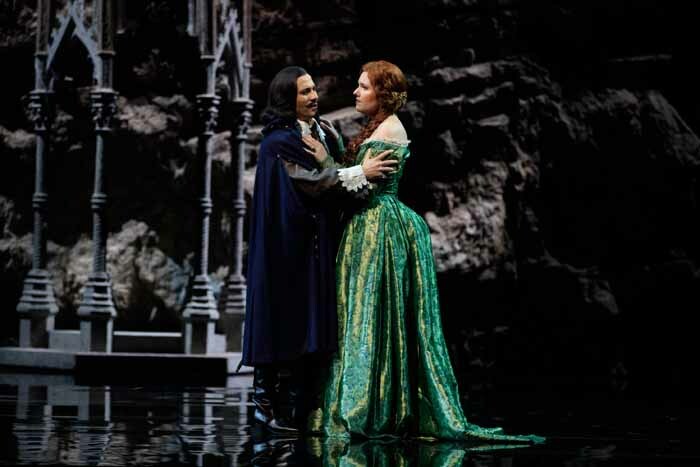 I had heard her once before here at the Capitole (as Countess Almaviva) and after this I am sure we will soon be hearing her in the major opera houses. The three main male singers were all very good too. Sergey Romanovsky who sang Edgardo had a good voice and managed the high notes but had a touch too much vibrato for my taste. He was a very good foil for Lucia even if not such a good actor. Maxim Kuzmin-Karavaev who sang Raimondo had a surprisingly good voice for this part reaching the high notes although they perhaps could have benefited from a little more rounding. His handling of the difficult mad scene was especially good. Vitaliy Bilyy was Enrico and came over very well with a fine voice and good acting. The part of Arturo was taken by Florin Guzgă a new name to me but not quite up to the same standard as the principals. The conductor was Maurizio Benini, an Italian conductor who has appeared many times at the Capitole and for whom Donizetti runs in his blood. The orchestra were in great shape and one heard many desirable things in the score which one often does not hear. As is now customary at the Capitole the chorus, under Alfonso Caini, were in fine form, all 50 or 60 of them. 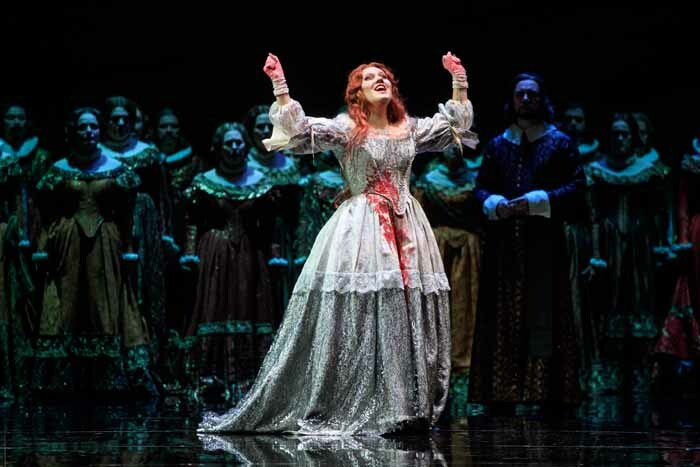 We could do with many more operas like this one!